(S1) PARTNERS IN CRIME! E10. ~ CK Jacob: Nigerian Fiction And Lifestyle Blog. Episode 10 Title: The contractor and the new beginning! Looking at his name on the list of a brutal killer rendered him speechless. Tiwa had to be sure of the name she was seeing. She took it from his hand and looked again closely. She believed the way her heartbeat sounded, everyone around her heard. She gripped her chest thinking she was going to have a heart attack. Fear surged into her thick bones. “Are you okay?” Genevieve asked her. Adebiyi who was lost in another world in his head had no idea Tiwa almost lost her balance if not that Quincy caught her. He came back to his right senses when Genevieve called his name twice to gain his attention. “Oh my God!” He exclaimed as he saw Tiwa on the chair appearing like someone that fainted and was regaining back her strength. ”Are you okay?” He gestured towards her and touched her by the arm. “So what do we do now?” Genevieve asked. Adebiyi sighed miserably and rubbed the back of his head. He looked at Tiwa and saw how teary her eyes had become. He felt dejected. Adebiyi left to get a pen and paper to write what he needed. He came back with One female and three male names. “I will advise you to stay in door by tomorrow until we know who we are dealing with. You are not alone in this.” Quincy told him. “Who did you leave your son with?” She asked in a concerned voice. Genevieve and Quincy drove back home. Tiwa remained in the living room with Adebiyi. They sat close to each other. He thought of calling Popoola and he asked Tiwa if he should. She gave him the permission to do that. Popoola was shocked and wanted to drive over to his house. Adebiyi ordered him not to risk his life in the middle of the night. “I will be there first thing tomorrow morning.” He promised. At 5:50am, Popoola was already at the doorstep of Adebiyi’s mansion. He and Tiwa fell asleep in the living room and woke up when they heard heavy knocks on the door. Tiwa opened and let him in. Adebiyi told him what Quincy was going to do about it. “Sure?” She said, left and came back with a copy. 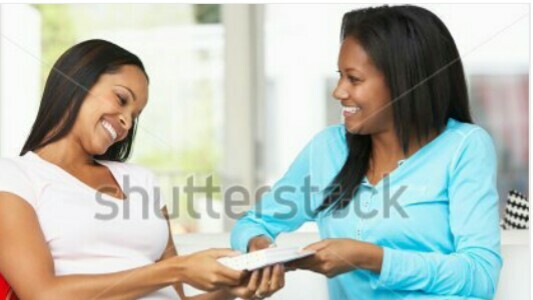 She handed it over to him. “If we should look at it, he came when all these started happening,” She pointed a finger at Ade. “And you told me he worked in that house before he joined the army!" “I will do that now!” Ade grabbed his phone and called Quincy. After he finished the call, Popoola spoke. He tried his number but switched off. “The only way we can do that is track him. I hope he is online.” He scrolled down to the hacker’s name on his phone and called him. “No problem.” Popoola said and smiled. Early in the morning, Genevieve received a call from the inspector. He would have called her at night but he didn’t want to disturb her. He wanted to let her know the officers that went to the fourth target’s house checked the immediate younger brother’s travelling bag and found a gun. He was arrested. She was glad to hear the news. She left Quincy at home who was making several calls when he was not able to get across to the employee he knew in the penitentiary. Genevieve took a taxi to see Leroy and his family. She explained the reason she had not come to see them. They understood. Chisom was very happy to see her. Genevieve gave Jasmine a gift. Leroy asked if he could help in the investigation but she politely told him no. Tiwa was happy to see Genevieve. Even if no solution had come, her presence meant a lot. The four of them waited for Jeremy’s call. Quincy was finally able to get across to an old friend who drove down to the location of the prison. It took him thirty minutes to get there. The worker was a matured woman who Quincy assisted with a loan many years ago. She was happy to hear from him. She had changed number and lost his contact. She was delighted to help him of his request. All the details were documented in the computer. “Please check for Hill Jerry. I want to know the names of the people that have visited her. “Thank you! That’s the name I want to hear! I owe you one! !” Quincy didn’t waste time to end the conversation. He called Adebiyi on his way to his house. “It’s Dotun,” Adebiyi said to Tiwa, Genevieve and Popoola after the call ended. They were speechless. They heard the sound of a bike. Jeremy came down from the bike and ran towards the entrance door. Adebiyi opened for him. “He’s online!” The rest of them seated sprung up on her feet and moved closer to him. Jeremy set his laptop on the table and turned on the software. He pointed to a green round light. As they stepped outside, Quincy showed. Genevieve and Popoola joined him. Adebiyi drove himself, with Tiwa and Jeremy in his car. As they got there, the green light blinked fast. Adebiyi drove and as he got to a particular spot, the green light blinked faster. He turned off the ignition of his car, and looked at his right. “We are in a big supermarket. The second largest one here in Abuja.” They came down from the vehicle. Quincy, Genevieve and Popoola did the same. They walked inside together. “He is probably using a laptop to browse.” Adebiyi said. They agreed. As the pair went separately, Tiwa and Genevieve asked two workers if they knew anyone called Dotun. They shook their heads. They worked towards the perfume side and looked straight at the end. They sighted a man wearing an all-back outfit with a yellow face cap. He was pressing a laptop. As they approached him, he looked up and saw Tiwa. They had brought out their guns, he jumped on his feet and raced. They ran after him and started screaming, telling him to stop. Staffs, customers lay flat on the floor when they saw the chaos. They feared for their lives and had no idea what was happening. Adebiyi, Quincy, Popoola and Jeremy ran. Jeremy farsighted a black bag closed to where Dotun sat. He went there to open it. “I have found the bomb!” He yelled. Popoola heard and motioned to his side. The partners continue to chase Dotun outside the supermarket. They were not familiar with the area and if they lost him, it would be the end. Tiwa stopped running. She lifted her gun and focused on Dotun. “Don’t shoot!” Adebiyi screamed. "Don't kill him!" BOOM!!! She hit him on his left leg. He fell on the floor and whipped in pain. He tried to stand up but it was difficult for him to run. Genevieve and Tiwa ran to meet him. He screamed at them. Genevieve gave him a blow on his nose. “I will sue you for assault!” He bellowed in pain. Tiwa gave him another hard blow. This time, blood came out. He was arrested. Everyone connected to the contractor was charged to court. The contractor was sentenced to life imprisonment. The sister in law of Modupe, wife of the Engr. and the daughter of the first target were to die by hanging. The rest who were unsuccessful to kill their targets were jailed for fifteen years. I know what I have done to Jude is unspeakable. Ever since I transferred him to a better health care center, I find it hard to believe what I did to him. He was the man I swore to love for the rest of my life till death do us apart. I will have to cook up a better story to tell the kids why they were far from their father and the reason I lied. I hope they understand and forgive me. Jude hurt me. Yes, he did. I loved him with all my heart but he betrayed me. I had my revenge yet it doesn’t feel right anymore and I did not gain anything from it except wealth. Vanity upon vanity. If my brother’s wife succeeded in killing me, I would not have taken a piece of naira or a dollar to the grave. I give all my gratitude to God, Tiwa and Genevieve for investigating the case and saving my life. The personal psychiatrist I employed to look after Jude has put so much effort and I am getting good result. Jude is no longer violent without the chains used to tie his hands and legs. I have been told with time, he would be able to recognize his family. I can’t wait for him to call me his wife again and forget the past of his mistakes and mine. I would be willing to make my marriage work and be close to God like my mother advised. Tunde that I thought wont forgive me has been supportive. He did everything to make sure the transfer of Jude was quick. There’s was one thing that bothered me and I was going to try and make it right. I drove away to the residence of Rosemary. I hope her child was alive. The condition I left her that day would have caused some damages but I prayed to see everyone in her family alive. When I got there, I met a man who told me she had moved out but they stayed close. He directed me to a roasted plantain stand and informed me it was her mother’s place of work. I realized they still lived in poverty. I went there and met the old woman who didn’t recognize me. She wanted to take me to meet Rosemary when we saw her approaching. She was looking haggard and dirty and I wonder what she must have been doing for the past few years. Rosemary came, gave me a double look and knew exactly who I was. I was shocked when she fell on her knees and started begging for forgiveness. “I shouldn’t have slept with your husband and disrespected you. I was wrong.” She cried out continuously. Her mother joined her and I pleaded for them to hear me out. They stood up. “How is your child?” I asked. “He is fine.” Rosemary replied. “Rosemary Uchenna.” She answered me in a puzzled voice. I knew she was wondering what I was writing. I gave it to her after I was done. Her mother stared at us with a confused face. “I will!” She tried to hug me but I gestured away to avoid a foul odor or a stain on my dress. Rosemary told her mom and both of them thanked me. I suddenly felt shy when I noticed eyes were on me. I bid them goodbye and drove off to see how my husband was doing. Kate paid a surprised visit to see Sebastian and met not only him but Joseph and Lucky. “I am allowing you into my house because of your friend, if not I would have sent you out of here!” Sebastian told her angrily. “I am deeply sorry for what Ashley did.” She begged. “Are you telling me you had no idea what he was planning to do?” Joseph asked. “I don’t bloody care. Just go!” He walked away. Joseph followed him behind. Lucky motioned to console her as tears dropped down her face. I believe in love but I haven’t found the woman that would capture my heart. These past few days have been terrible. It stopped me from chasing women and clubbing and now that things are getting back to normal, my way of life does not interest me anymore. I love the way Lucky loves Joseph and I pray to see them together for a very long time. I hope to change and be a better man. I want to have kids in the future and be able to tell them bedtime stories. I don’t care who my future wife is or her past life, I just want someone that would love me for who I am and not what I have. If nothing was done on the case and I died, I would have no one to take over my businesses and my part of the company. If Joseph knew I have written my will and given everything to his son he would never forgive me. I would change it when I have mine. Joseph has begged me several times to take a woman serious, get married and have kids. I would surely change and learn from my brother. He has tried to tolerate my nasty attitude and I am proud to have him as my flesh and blood. My precious twin. The day I met Sebastian has been one of the great moments in my life, same goes for meeting Lucky. The woman that owns my heart. My family are everything to me and I will do all my best to be there for them. I would protect them even with the last strength left in me. Without them, I won’t survive. No matter how Sebastian try to frustrate me, I will show him love and never stop advising him. I know that one day he would be a good father and a devoted husband to the right woman. There is no way I would stop praying for Sebastian to change. I know he will. It gives me joy to see my family happy and together in peace. Joseph and I have not been intimate because of the threat to Sebastian's life but now that it is over, I think this is the appropriate time to start putting more effort to have another child. “Honey!” I said as I got close to the room. I entered the room, locked the door with the key and joined him on the bed. The look in my eyes made him blush and he knew I wanted all of him. “Come here.” He said with a smile on his lips. I moved closer, touched his body and we kissed like never before. Hector will forever remain my prince charming. He is the love of my life and my husband for eternity. Anytime I look into his eyes, I feel warm, beautiful and free like a bird. He has showed me unimaginable love that I cannot find the right words to explain. I wonder if I deserved his kind of love and affection. I love him and I will continue to, no matter what. I might not have survived if he had died because he completes me. Renee is the woman for me. God sent her to change and bless me. I feel lucky and always thrilled when I see her. She has given me a second chance to forget who I was. What more can I ask of? I have her and the kids and I would cross the ocean for them if I have to. She is the one for me. She has always be the one sent from heaven. She’s my guardian angel. I could hear footsteps coming my way. It was Renee. She came to meet me where I sat and said, “Hector you are my light and shining armor. My lion. I promise to love and take care of you and have more children if you want.” She winked. A week later, Quincy and Genevieve organized a birthday party for Freddie. It was fun and there was enough food and drinks for the guests. Leroy, Chisom and Jasmine came. Akin and other employees of the NIB arrived to celebrate with their boss, his wife and son. “You invited Modupe Lawson?” Tiwa asked Genevieve as she saw her moving towards them. “I understand. Have you made a decision?” He questioned. “What is it?” he asked in a curious tone. Two days later Adebiyi drove Tiwa into the building of GT Bureau. She was puzzled and amazed at what she saw. She didn’t understand what was going on. She entered and saw neatly dressed men and women on their feet, smiling at her. She turned to her right side and saw Genevieve, Quincy, Popoola and Leroy. She was surprised to see Hector, Renee, Socialite Ayodele, Sebastian, Lucky, Joseph. Genevieve had invited them. “I don’t understand.” Tiwa said and rotated back to find Adebiyi on one bended knee. He was holding a diamond engagement ring. She gasped. “Congrats my baby.” A male voice said from her back. She was stunned to hear his voice. She turned. “Dad! !” They hugged. He hugged her and everyone clapped again. Her office was big, same with Genevieve. Adebiyi introduced the employees in their departments. He took her to another building positioned at the back. He introduced her to Dr. Omoni Obafemi and two of her assistants. “Nice to meet you.” Omoni said. “Nice to meet you too.” Tiwa said. They left and joined the others at the bigger building. They were eating cake and drinking wine. “I agree.” Genevieve said and smiled. “Today is wonderful! This is the happiest day of my life!” Tiwa said in an excited tone. The partners burst out laughing. The End. Please read below…..
PARTNERS IN CRIME SERIES WILL CONTINUE ON THIS BLOG FOR A LONG TIME. IT MIGHT BE A YEAR OR MORE, DON’T KNOW, IT DEPENDS ON HOW MY BRAIN WORKS… LOL SEASON 2 WILL COMMENCE AFTER ‘IRREPLACEABLE SERIES'. LET ME GIVE YOU GUYS SOMETHING NEW. IRREPLACEABLE IS DRAMA FILLED. I BELIEVE YOU WILL ENJOY IT. Four couples that are close friends are going through different phases of life. A beautiful, simple and single mother of one thrives hard to give her child the best. This complex story is filled with dirty secrets, blatant lies, betrayal and above all, true love. (It will start on Wednesday). THE BODY OF A FIFTEEN-YEAR-OLD GIRL IS FOUND DEAD BESIDE A ROAD. IT SEEMED LIKE A HIT AND RUN ACCIDENT UNTIL SHE WAS TRANSFERRED TO GT FACILITY FOR AN AUTOPSY. 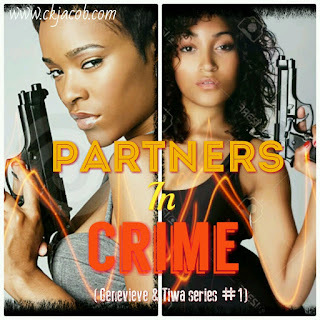 GENEVIEVE AND TIWA WILL LOOK INTO THE CASE AND DO EVERYTHING WITHIN THEIR POWER TO FIND HER KILLER. A WOMAN VISIT TIWA AND GENEVIEVE IN THE GT BUREAU AND ASK FOR HELP. SHE WANTED THEM TO RE-INVESTIAGATE A MURDER CASE AND PROVE HER HUSBAND IS INNOCENT OF THE CRIME SHE BELIEVED HE NEVER COMMITTED. Thanks guys for coming back for more! Dancing* Let me relax with my popcorn and read. You've really made my day. Im blushing hard! Your comment dey do my body jigi jigi. I'm thanking you too. May God bless you! I kept suspecting this Dotun guy and I was right after all. Carina, this is a job well done. Beautifully scripted and organised. I wonder how you do it. My sister, just keep on keeping on.Tthis talent shouldn't be kept in the box and placed under the bed. Please try and publish your first book. You are truly talented. Stay blessed. Your comment makes me happy. I am doing everything i can to publish my first novel. May God answer my prayers. I know he has heard. Thank you Jolly! I am so proud you are a Nigerian! Thank you my love. Stay blessed! Well done Carina. This should be adapted into a movie or series. Wow! Great job. I hope I will be able to do it. It might only take time. May God allow our dreams come true. Waooh, carina you have really done well,i love the ending of episode 1 and can't wait for 2 and 3, one thing I also pray is that sabastian should found a good woman .in the next episode. God has really blessed you with a good talent babe, so go out there and explore.nice one.